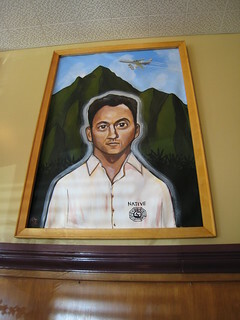 It's "Hawaii 5 Spot" theme at the 5 Spot restaurant, at Queen Anne and Galer in Seattle. The 5 Spot features a rotating regional cuisine and decor. I had a Moco Loco Burger (very good, and come with thick-cut sweet potato fries). I especially enjoyed this LOST-related original painting.